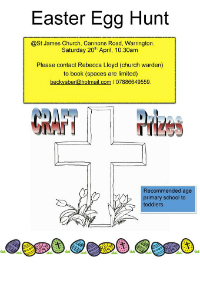 We have a lively programme of social events at St James. Everyone is welcome and we would love to see you at any of our events! 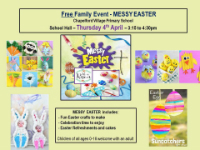 Messy Easter - a free fun family event - is happening after school at Chapelford school on Thursday 4th April - children of all ages welcome with an adult. Come and join the fun! St James Church is a Place of Welcome. Places of Welcome is a growing network of hospitality run by local community groups who want to make sure that everyone in their area has a place to go for a friendly face, a cup of tea and a conversation if and when they need it. Everyone is welcome to come along on any Thursday between 1pm and 3pm for a brew and a chat. Both of these family events finish with refreshments at 4:30pm. All families are welcome - just come to school reception on the day.